The 2nd Swivel allows for greater freedom of thumb movement. Cut vertically or diagonally from a low stress position. 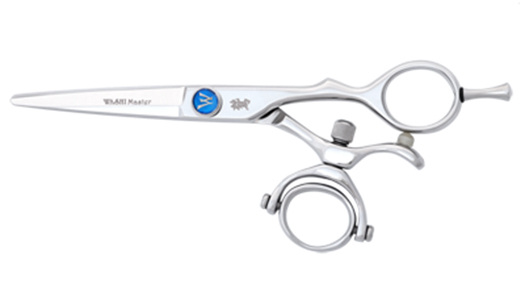 Washi's Master Double Swivel Shear. Forged from Authentic Hitachi V-10 Cobalt steel. Quality that allows you to Slice through the hair effortlessly. The 2nd Swivel allows for greater freedom of thumb movement. Cut vertically or diagonally from a low stress position. Flatter wrist, lower elbow and lower shoulder position means greater comfort.